As I mentioned in my first post, I spend a lot of time on weekends visiting local motorcycle dealers and testing out new bikes. I’m grateful that most of the dealers in my area support test rides and will let me take a spin. I’ve even been honest with them: “I’m not looking to buy.” They seem to get it. Maybe I’ll take a ride and just have to have the bike. This has happened recently. Twice this season, in fact. So as the season winds down, I’m going to list the bikes I tested this year and provide a brief blurb on each. When I put this list together, I was pretty shocked. I’ve ridden a lot of different bikes this year. 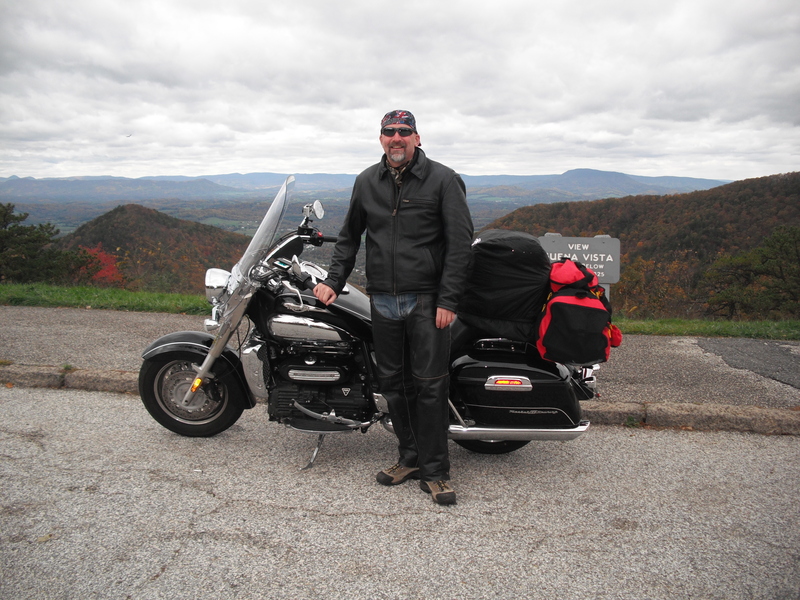 With my Rocket III Touring on the Blue Ridge Parkway, October 2011. The Rocket was made for trips like this. 1a. Rocket III Touring. Numero Uno on this list is the bike I currently own. I rode the R3T a number of times at a demo day at Eurosports back in May. I liked it so much I ended up shopping for one and bought my current ride from Hermy’s later that month. Since then it’s been a love/hate relationship. In summer, on a 90 degree day, in traffic, I hate this bike. It is like riding a convection oven, it throws off so much heat from that 2300 cc powerplant. When I’m filling it up with gas, I hate it. I’ve averaged 30 miles per gallon this year and more often than not been in the mid 20’s. But when I’m rolling up heavy miles and cruising along on a nice twisty, or passing a tractor trailer on the slab, I absolutely love it. When I’m on a trip with my friends and hauling my camping gear, I love it. When I park it on Main Street in New Hope next to about a dozen ElectraGlides and the peeps walking by stop to look at my bike and ignore the Harleys, I love it. 1b. Triumph America. This is the bike I started the season on, and was my very first motorcycle. I traded mine for the R3T and miss it. The America is just a sweet ride. 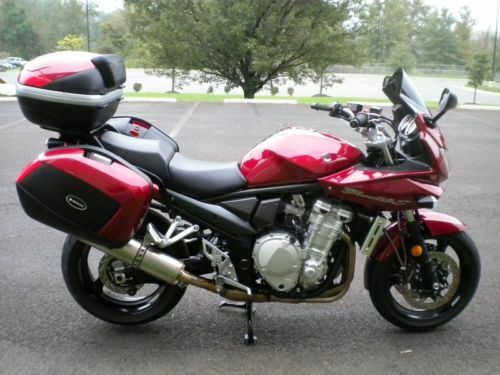 I started with it in base format with some comfort and convenience accessories, and over the four years I owned it changed the pipes several times, the air intake and jetting, added more accessories, and turned it into a bike that fit me like a glove. I’m not going to tell you I don’t regret the decision I made to trade it. I do at times. But I had outgrown it and noticed the lack of passing power at highway speeds. I could have spent a few hundred dollar bills to change that by doing some other performance upgrades, but ultimately decided to change to the Rocket. If you’re a first time rider, put the Triumph America at the top of your shopping list. It can be accessorized to your heart’s content, both with Triumph and aftermarket accessories. It’s power can be upgraded as you go, and some of these mods are DIY (changing pipes for example. Pulling the snorkel to enhance air intake. Rejetting the carbs for 2008 and older models, or downloading a new tune for fuel injected models.) And the bonnevilleamerica.com forum is simply one of the best and friendliest in all of the motorcycling world and if you have a question, post it there and it will be answered in minutes. This bike gets my biggest thumbs up possible for the first time motorcycle rider. I got three good years out of it and loved every minute of riding this bike. 2. Suzuki Bandit 1250. Late in the season I stopped by Martin Motorsports, my absolute favorite dealer in Southeast Pennsylvania, and they had a used Bandit 1250 on the showroom floor. This was a bike I seriously considered for my first bike, and seriously considered upgrading to after a year of riding, so it’s always been in the back of my mind as a bike I’d like to own. This example had a number of aftermarket upgrades including a sweet-sounding Two Brothersexhaust, steel braided brake lines, and I’m sure other performance upgrades that may not have been visible to the naked eye. Oh. My. GAWD. I fell in love with this bike. The entire test ride I could not stop grinning. So much pep. So much character. Responsive. Comfortable. And the SNARL that came from that Two Brothers Exhaust was just plain intoxicating. I dismounted and bought it on the spot as a second bike, a commuting machine that I also had the option of touring with since it had triple hard bags. Except, I didn’t buy it. Since it was Saturday afternoon the banks were all closed, and I couldn’t get financing done. I left with an agreement to finish the paperwork on the deal by fax on Tuesday when the dealership reopened. In the meantime, someone at Martin Moto dropped the ball and forgot to take the bike off Ebay. And of course, someone exercised the “Buy it Now” option over the weekend. ^$*&%*(@#!!!! 3. Triumph Thunderbird Storm. This was my service loaner from Manayunk Triumph when I brought my Rocket for it’s 10,000 mile service in July. I really liked it. It was powerful, the exhaust note was a nice throaty rumble even with the stock pipes, it’s badass-looking, and it handles like a cafe racer. It’s just not a practical bike for me since last time I checked, there are no decent windscreens available. I tour on my bikes so a windscreen is a must have. And the few times I’ve tried to ride without one, I haven’t enjoyed myself as much. I know there are bikers who would consider this to be heresy, but it’s my personal preference to have some protection from wind buffeting. 4. Triumph Bonneville T100. I had this for 2 days as a service loaner, also from Manayunk Triumph, when I had clutch issues in August. What an absolute hoot to ride. Quick, light, maneuverable, fun, and it gets looks everywhere you go. 5. Triumph Sprint ST. I didn’t think I would like this bike as much as I did. I tested a Sprint several years back at a demo day and didn’t feel comfortable at all. Kept getting cramps in my hips from the riding position. But this time, I really enjoyed it. It was ‘close’ to the Bandit 1250. Good, fun bike, fast as can be, nice exhaust note. 6. Suzuki Vstrom 650. I really like the Vstrom. It’s just a great bike that does everything well and reportedly is a breeze to maintain. Bonus points for the fact that it can be taken off road (within limits.) Nice well-farkled used Vstroms can be had for $4k ish, so I may add one to the stable next year. Also, this is a bike I highly recommend for first time riders who are over 6 feet tall. As noted it’s easy to maintain, there are a plethora of accessories available for it both new and used, there’s a really good forum for Vstrom owners where you can get tips and advice, and the 650 cc engine is tame enough to make a first time rider comfortable, but has enough power to keep you interested in the bike for years to come. If you’re a first time rider thinking about what to get, and the Adventure Sport category is interesting to you, consider this bike. 7. Thunderbird 1600. Nice bike that I found to be very comfortable and responsive. I rode the base Tbird at the same demo day in May where I fell in love with the Rocket. It was a close second. A really fabulous machine that handles great and has power to spare. The one thing I really hate about it is the tiny tiny Triumph badge on the tank. I want my Tbird to scream Triumph, not whisper it! 8. Suzuki GSX1250FA. Technically this is a Bandit with a full fairing. But I just didn’t have the same connection to the bike that I did to the Bandit I test rode. It was a bit ‘meh’. 9. Triumph Tiger 1050. I so want to like this bike. But I’ve ridden it a number of times at demo days and just can’t connect with it. I was shocked that I liked the Sprint better. 10. Triumph Tiger 800. Another bike I really want to love. Everyone seems to. I just didn’t get it. 11. BMW F650GS. Too small for my 6’2 frame. 5 minutes into the ride I knew it wasn’t for me, and just turned out and brought it back to the dealer. If you’re under 6′, consider it because it’s a nice looking bike. But if you’re over 6’2 and like the Adventure Sport category the Vstrom is the better choice. 12. Kawasaki Versys. Like the BMW 650, this just didn’t fit. Not for riders over 6′ or so. 13. Triumph Scrambler 900. I think there was something wrong with the one I tested. It was sluggish and balky. 14. Suzuki Vstrom 1000. This bike sucked. I was warned about this by the dealer, who said that the Vstrom 650 engine is excellent but that Suzuki just hasn’t gotten the fueling right on the 1000 cc version. So it was a good season for test rides. I appreciate dealers like Martin Motosports and Montgomeryville Cycle Center that will let a fella take a test ride, no questions asked. And I have always thought that Triumph was very smart with their demo day strategy – I wouldn’t have bought my Rocket III if it weren’t for my experience riding it at their demo day in May. I wish there were more dealers like this who realize we can’t make a four- or five-figure purchase without testing the bike first.